I received a copy of this book from Midas PR in exchange for an honest review. All thoughts and opinions expressed here are my own. When eleven-year-old Dev’s father dies, he can’t stop lashing out at those he loves. Until he meets Sanjay, a sprite-like being who claims there is a battle raging inside Dev’s own body. Sanjay embarks on a perilous journey beginning in the darkest realm at the bottom of Dev’s spine. As he searches for the noble warrior Prince Arjun, the only hope to defeat wicked Prince Ego, Sanjay encounters starving mobs, thieving gangs, water worlds and lands of fire, until at last he finds Arjun on the battlefield, ready to fight for Dev. This book takes the epic battle within the Gita and transports it inside the body of a young boy called Dev. A classic story of good overcoming evil, through Dev and Sanjay’s adventure, readers will be able to connect with some of the deeper concepts in the Gita. 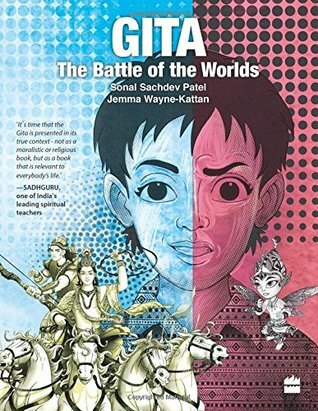 Gita is a book that simplifies the core concepts of the Bhagavad Gita for children. Bhagavad Gita is a scripture that is a part of one of India’s famous epics, Mahabharat. This book is an interesting retelling of the Bhagavad Gita, with a brilliant premise–there is a war waging inside everyone’s bodies. It’s between your ego and the spiritual/divine part. The side that wins decides who you are as a person in real life. This book focuses on Dev who’s depressed and angry because of his father’s sudden death. One night, while wallowing in self-pity, he meets a pixie-like creature named Sanjay. The next part is where the story gets trippy–Sanjay goes inside Dev’s “bodily kingdom” to find Prince Arjun (Dev’s spirituality) and make him defeat Prince Ego. While I found the premise interesting, I would have liked it if the story had more details and focused on the war a little too. But this is perfect Middle Grade fiction and just the kind of story you can use to get kids started on Mahabharat. It also opens doors for discussions on how Mahabharat is not just a boring old epic you have to study to pass Hindi in school, but a great story that is still relevant in today’s world. Previous Post How I went from abhorring to absolutely loving The Sound and the Fury by William Faulkner. Great review! This sounds like it has such an important message. The war within the self, reminds me of a speech I heard somewhere. Paraphrasing it wildly, of the four yugas we’ve had, in the first one, the good and evil would fight it out from across heaven and hell. In the second one, the fight occurred across nations, in the third, it was within families, and in the last, it is within the self. And this resonates with the way stories are told too. Consider the earlier avatars, and the war was between Deva and Asura (Koormavatar). Then we had wars between countries (Rama) and within families (Krishna). And now it’s each to their own. Haha, yes, it is middle grade. But I wouldn’t recommend this to learn Mahabharata. For that, you need to watch Mahabharat, the tv show. That’s how I understood the story, haha.